Fun is used to describe many things – be it a night out karaoke-ing; catching a play; or even dancing. And from what we witnessed during the media preview of Mamma Mia!, many in the audience were combining all three activites into one! Last staged here in 2004, the feel-good musical is back in Singapore for another run. If you have not seen or heard anything about this at all (seriously? ), the musical strings over 22 of ABBA’s most popular hits into a story played out on stage. Taking place in a fictional Greek island, Sophie hopes to find out the identity of her father so that he could walk her down the aisle for her upcoming wedding to Sky. When she stumbles upon her mother’s (Donna) diary, she decides to invite the three men (Sam, Harry and Bill) her mother last met on the island 20 years ago. Far-fetched as the plot maybe, it sets the stage for the acts and accompanying songs that lead up to the wedding. There were some emotional scenes but it was the light and comedic sides of the musical that stood out. Donna (Shona White) and her two bffs Tanya and Rosie (Helen Anker and Nicky Swift) were especially entertaining in their Chiquititas rendition. Gimme! Gimme! Gimme! (A Man After Midnight) was of course reserved for the bachelorette party. The young lovers Sophie and Sky (played by real-life couple Phillip Ryan and Lucy May Barker) were perhaps a little weak in their Lay All Your Love On Me number. The three fumbling ex-lovers Sam, Harry and Bill (Daniel Crowder, Matthew Rutherford and Tamlyn Henderson) were nicely grounded and mellow as wine. 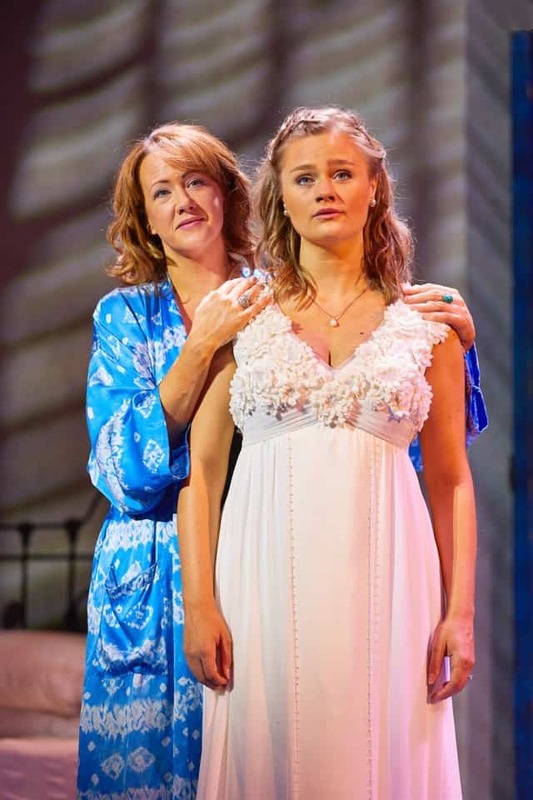 Unlike most musicals, Mamma Mia!’s curtain call (where actors take their bow at the end of the performance, which Shona White received the loudest applause) wasn’t the final act. 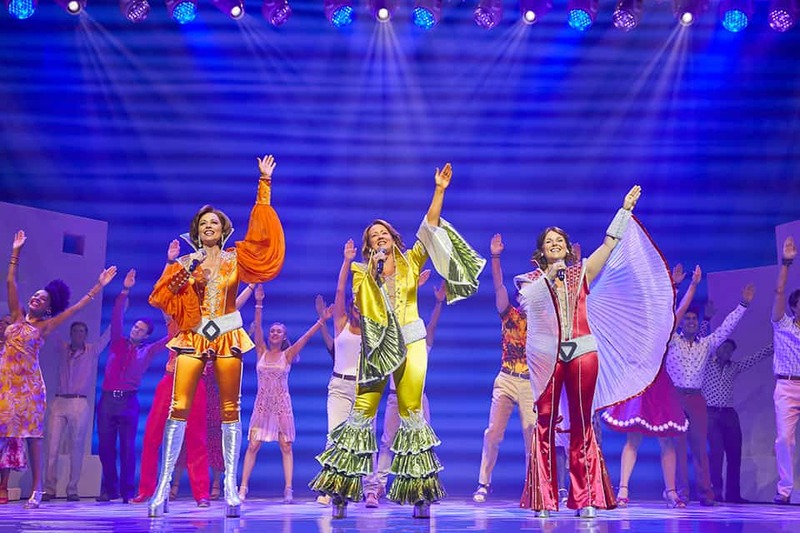 Like an after-credit treat at the movies, Donna and her friends changed into ABBA-inspired disco gears to belt out a medley of more of the Swedish group’s hit songs. 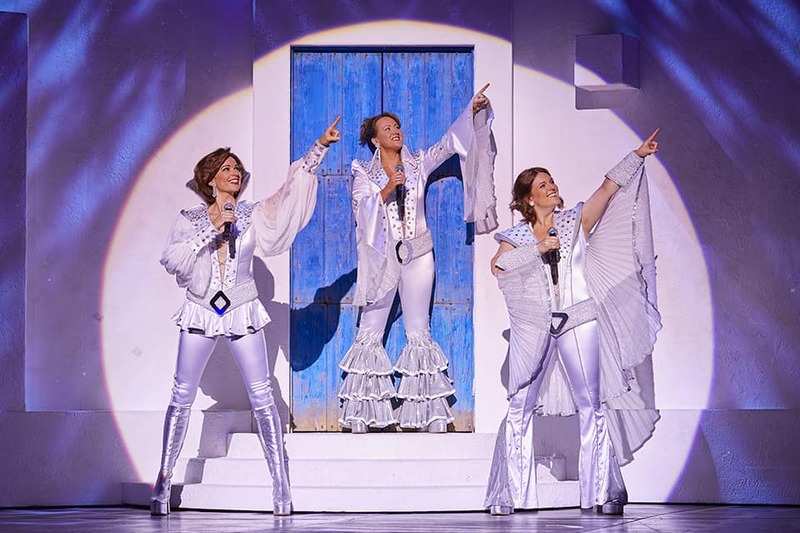 And that’s when the party started, where the said singing-along and dancing-along went full scale among some of the audience… We believe the musical has made its point, and we have no doubt that ABBA’s music will live on forever. MAMMA MIA! runs from now till 18 November 2018 at The Sands Theatre, Marina Bay Sands. Tickets are priced from $58 to $188, available here.